The Christmas Tugboat: How the Rockefeller Christmas Tree Came to New York by George Matteson and Adele Ursone. Review: HOOOONK! HOOOOONK! The big tugboat sounds as it nears the mark where the festive Christmas tree will stand tall. A little girl goes with her Mom and Dad on an exciting tugboat adventure. They go up the Hudson River to pick up a special surprise for the State of New York! It takes some time as they go back down the Hudson river, but as the family arrives in New York, the little girl stands and watches in the pilot house as the crowd goes by waiting for the tree to arrive at the special destination. But, will they make it without the tree falling off of the tugboat? The Christmas Tugboat: How the Rockefeller Christmas Tree Came to New York,, written by George Mason and Adel Urson and illustrated by James E. Ransome, is a childrenÕs book that will spread the Christmas Cheer! The Christmas Tugboat is a great read aloud although some of the vocabulary is a higher level than the preschoolers who are the intended audience. The authors include words like barge and buoys. A dictionary reference or definition in the front or back of the storybook would have helped. The storyline in the book flows well and it makes sense of the events that are happening. However, in this case the illustrations in the book may have been a little too dark in color and too much in some areas for this specific age group. Also, the words could be a little clearer, they could have been bolded or lighter/darker. The Christmas Tugboat is a book that adults will enjoy to read to their child during the Christmas season. Overall, I would not recommend this book to a little child because of some of the hard, challenging vocabulary and darker pictures. But, for an older audience, The Christmas Tugboat would be a good choice, and I recommend it to that age group. Review written by Lily (6th grade student). 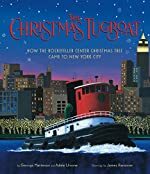 We would like to thank Clarion Books for providing a copy of The Christmas Tugboat: How the Rockefeller Christmas Tree Came to New York for this review. Have you read The Christmas Tugboat: How the Rockefeller Christmas Tree Came to New York? How would you rate it?